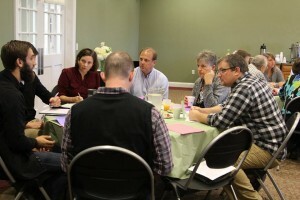 At the 2015 Conference Assembly the delegate body affirmed the Faith and Life Church Together Statement that calls for “the conference to reestablish the Faith and Life Commission for the purpose of providing at least quarterly gatherings for pastors to discern and study scripture together.” The first of these Faith and Life gatherings were held this month. The Faith and Life commission was established the first quarter of 2016 and includes Rose Bender (Whitehall) as chair, Josh Meyer (Franconia) as vice chair, Nathan Good (Swamp), Kris Wint (Finland), Verle Brubaker (Swamp), Penny Naugle (Plains), and the staff liaison is the conference executive minister. The commission has been meeting since May of this year reviewing the Church Together Statement, ministry description, and preparing for the quarterly gatherings. This month they held their first quarterly gatherings at Plains, Salem, Indonesian Light, and one by Zoom teleconference. 60% of the conference’s credentialed leaders participated. The theme being going to the margins. A recurring question that came up from the feedback of these gatherings was how do we think together theologically about the issues we are facing? In September, the conference was reminded about the importance of spiritual practices when living in covenant with one another at the conference-wide gathering with MCUSA moderator-elect, David Boshart. The commission sees learning to hear God together as a spiritual practice and looks forward to the coming faith and life gatherings as a way of engaging this spiritual practice together with other credentialed leaders. Future topics will be announced as the dates of the gatherings are announced. Currently, the commission is working on dates for gatherings in February, May, and August of 2017. Stay tuned for more specifics.